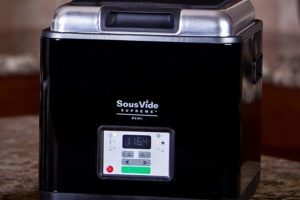 Sous vide is regarded as the best, most accurate means of getting food cooked. In a nutshell, this is done by placing food to be cooked inside a resealable plastic bag and set in a water bath. 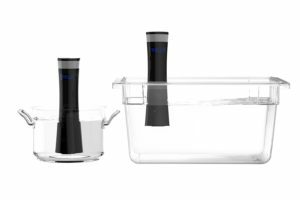 The water bath has precisely controlled temperatures that you set depending on what type of food you wish to cook, including meat, poultry, fish, vegetables, and eggs. 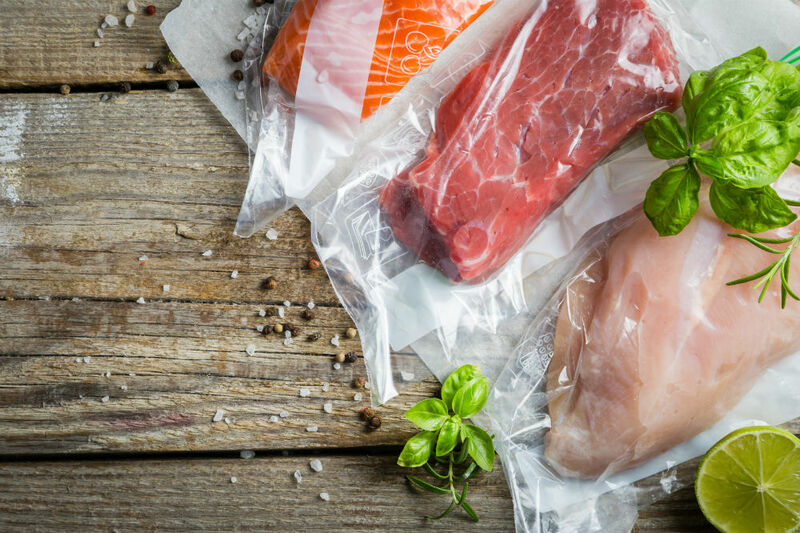 A sous vide temperature guide is useful for obtaining perfectly cooked foods. 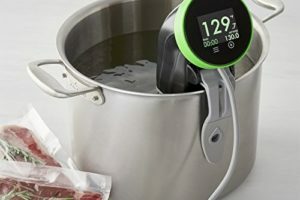 The other benefits of cooking using the sous vide method, as well as sous vide cooking times, are also discussed below. 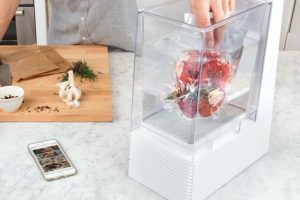 Before we get into the sous vide temperature guide, it’s important to note that cooking times are critical not only for taste but also for food safety. Being aware of the appropriate temperature to cook various foods via sous vide will also enable you to save energy and time. Different kinds of foods obviously have different cooking times. Apart from the temperature, you also have to consider the thickness of the meat/fish/or veggies you are cooking, as the temperatures that are stated below also correspond to a certain thickness. 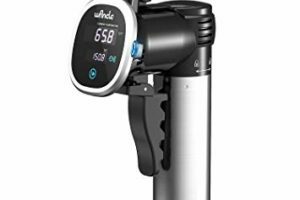 This sous vide temperature guide gives cooking temperatures in degrees Fahrenheit, along with thickness/size of food product, and the range of minimum and maximum cooking times. When it comes to pork, different parts would mean different thicknesses, cooking temperature, as well as time. For a cutlet and chops, at 1-2 inches, it’s ideal to cook it at 134 degrees or more for a minimum of 2 hours to a maximum of 8. For tenderloin at 1 and a half inches of thickness, the temperature is the same, but you could cook it for as quick as 90 minutes for rare, and as long as 6 to 8 hours if you want it well done. For belly with a thickness of 2 inches, you could cook it at 185 degrees for quick cooking of 5 to 8 hours, and for slow cooking, which would last for 1 to 3 days, at the cooking temperature should be 167 degrees. Roast and spare rib cuts at 2 and 3 quarters of an inch thick could be cooked between 160 and 176 degrees, 12 hours at minimum, with a maximum of 1 day and 6 hours. Cooking time for fish, as well as mollusks and crustaceans, is relatively quick. For fish of various kinds, the required temperature is around 126 degrees Fahrenheit, while cooking time would be between 20 to 40 minutes, which would also depend on thickness. Thicker cuts would require longer cooking time. For Shrimps, Scallops, and Lobsters, it is advised to keep a 140 degree temperature, with shrimps taking the quickest at 30 to 40 minutes, Lobsters at 45 minutes to an hour, and Scallops at 40 minutes to an hour. For these kinds of produce, cooking time is not really a point of concern, given that a lot of these are pretty harmless when raw, and as a matter of fact, it is advised for vegetables to be consumed with as little cooking/processing as possible. Having said that, root and tender vegetables should all be cooked at 183 degrees Fahrenheit, with a minimum of 1-2.5 hours to a maximum of 4 hours for the root type, and a minimum of 30 minutes to a maximum of 1 hour and 30 minutes for the tender variety. Fruits are quick-cooking as well, and are to be cooked at the same temperature as vegetables. Firm types require a 45-min to 2-hour cooking time, with soft varieties having a cooking time of 30 minutes to an hour. Quick, Soft-cooked eggs, as well as scrambled ones, should be cooked at 167 degrees Fahrenheit, with a 15-18 minute cooking time for the former and a 20 minute cooking time for the latter. Slow cooking of soft-cooked eggs requires a lower temperature at 146 degrees, with a cooking time between 45 minutes to 1 hour and 30 minutes. For hard-boiled ones, the temperature should be 160 degrees, and it must be kept cooking for the same amount of time as that of the slow, soft-cooked ones. Lastly, for pasteurized eggs, cooking temperature is around 135 degrees, from 1.25 hours to 2 hours. The tender cuts for these should be cooked at 134 degrees or more, for as quick as an hour to as long as 6 hours, depending on the thickness. For the tougher cuts, cooking temperature is still the same, but for 1-inch bison, game, brisket, and flank steak, the cooking time minimum is 8 hours, with a maximum of 24 hours. Other parts take much longer, such as the lamb roast and leg, and spare ribs that can take from 10 hours to as long as 72 hours, depending also on the thickness. Once you have your formula dialed you can repeat the process and get the same delicious results each time.